Calculate the volume, surface area, lateral surface and slant height of cones by using this tool. Cone, in mathematics, the surface traced by a moving straight line (the generatrix) that always passes through a fixed point (the vertex). The path, to be definite, is directed by some closed plane curve (the directrix), along which the line always glides. 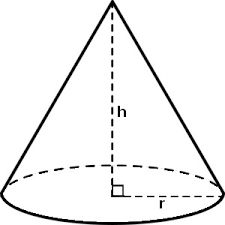 In a right circular cone, the directrix is a circle, and the cone is a surface of revolution. The axis of this cone is a line through the vertex and the centre of the circle, the line being perpendicular to the plane of the circle. In an oblique circular cone, the angle that the axis makes with the circle is other than 90°. The directrix of a cone need not be a circle; and if the cone is right, planes parallel to the plane of the directrix produce intersections with the cone that take the shape, but not the size, of the directrix. For such a plane, if the directrix is an ellipse, the intersection is an ellipse.The generatrix of a cone is assumed to be infinite in length, extending in both directions from the vertex. The cone so generated, therefore, has two parts, called nappes or sheets, that extend infinitely. A finite cone has a finite, but not necessarily fixed, base, the surface enclosed by the directrix, and a finite, but not necessarily fixed, length of generatrix, called an element.